Some links to sailing-related sites. Trailer Sailer Place Lots of great tips for all trailer yacht owners. Top Hat Yachts Rob was involved with building the early Top Hats. Wynnum Manly Yacht Club (Brisbane). Several RL 24s and RL28s. Regular racing and hardstand facilities available. Trailer Sailer Club of Qld. Kogarah Bay Sailing Club, Blakehurst, NSW, has several members with RL24s and hold class racing for RL24s. Goolwa Regatta Yacht Club Goolwa S.A., has one of the largest fleets of RLs in Australia especially RL28s. If you are after a great small boat for kids and adults alike, try a 125 sailing dinghy. 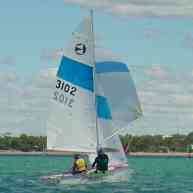 They are raced in sailing clubs all around the Australia. With a spinnaker and trapeze for the crew, and at 12.5 feet long, they are exciting to sail. Best of all you can pick a good one up for under $1000. I got one for my son for $300 which needed some work but a few weekends took care of that. Now we have an ideal boat for those days too light for the RL.